With a focus on analyzing and modeling linear dynamic systems using statistical methods, Time Series Analysis formulates various linear models, discusses their theoretical characteristics, and explores the connections among stochastic dynamic models. Emphasizing the time domain description, the author presents theorems to highlight the most important results, proofs to clarify some results, and problems to illustrate the use of the results for modeling real-life phenomena. The book first provides the formulas and methods needed to adapt a second-order approach for characterizing random variables as well as introduces regression methods and models, including the general linear model. It subsequently covers linear dynamic deterministic systems, stochastic processes, time domain methods where the autocorrelation function is key to identification, spectral analysis, transfer-function models, and the multivariate linear process. The book also describes state space models and recursive and adaptive methods. The final chapter examines a host of practical problems, including the predictions of wind power production and the consumption of medicine, a scheduling system for oil delivery, and the adaptive modeling of interest rates. 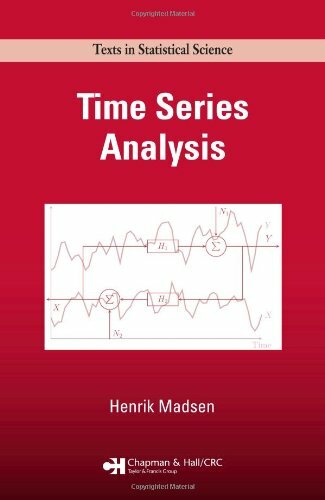 Concentrating on the linear aspect of this subject, Time Series Analysis provides an accessible yet thorough introduction to the methods for modeling linear stochastic systems. It will help you understand the relationship between linear dynamic systems and linear stochastic processes. Ancillary materials are available at http://www.imm.dtu.dk/~hm/time.series.analysis. This material includes solutions to problems, additional exercises, assignments (intended for being solved using a computer), and data used in the book.